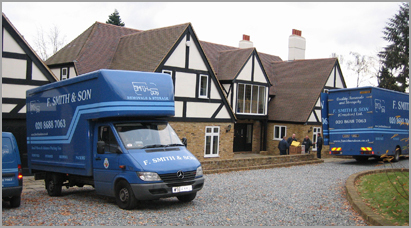 F Smith and son based in Croydon have been moving individuals and families to and from Sutton for over 75 years, experienced in delivering furniture to the many notable buildings, roads and areas within Sutton. If you are moving to Sutton for the first time or just moving round the corner within Sutton, F Smith and son are one of the most trusted and oldest removals firms in the area. F Smith & Son (Croydon) Ltd offer quality commercial removals in Sutton. Our highly trained staff have the expertise to relocate office furniture and equipment. All vehicles are equipped with the necessary tools to make your office relocation a seamless operation from start to finish. Our commercial relocation managers will liaise with you to create a full schedule for your relocation. Crate hire and delivery can be arranged well in advance of your planned relocation. Archive and document storage can also be arranged with data/document retrieval services. All factors considered, moving from one place to another is never an easy task. However, it becomes easier when you approach the process in an organized manner and most of all, when you are moving to a lovely place; and what place is lovelier than Sutton in Greater London. Let me demonstrate why you should be looking at the Sutton Real estate market and planning for it right now. For those who live outside London, Sutton is located in the Southern Part of the City. It lies on the slopes of the North Downs and is the principal town of the Sutton Borough. The scenic town has a long and beautiful history to it dating back as early as the 11th century. To start with, whether you are a single person or are raising a family, you will find appropriate and affordable housing in the area. The real estate market in Sutton accommodates all age, groups. For the parents with School-going children, you will be delighted to know Sutton has a record of having the best performing schools in the entire country. In addition, the schools are many and easily accessible from the different neighbourhoods. Another wonderful thing about Sutton is ease of transportation. If you are starting out in life and do not won a car, you will find it easy to commute using the many bus routes that pass through the city. There are also several train stations that will ease your movement. The town boasts a theatre that is several centuries old, there are also supermarkets, hospitals, libraries, cinemas, bookstores, swimming pools, spas, restaurants and pubs and other social amenities. With all these positive attributes, you can be assured that Sutton is one of the most refreshing places to live and work in Greater London.